Get the string name of the font. Get an OpenGL display list for rendering the font. Get the bounding box of a piece of text rendered with this font. Draw the given text on the canvas. An abstract class for fonts. 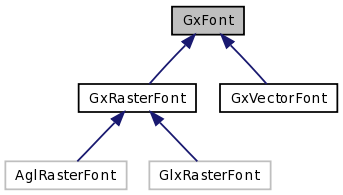 Definition at line 49 of file gxfont.h. This page was generated Wed Dec 3 06:54:47 2008 by Doxygen version 1.5.5.